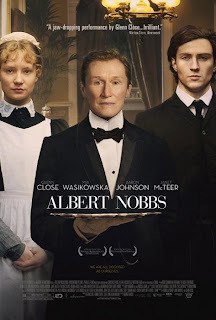 We were most interested to read this post as we have toyed for some time with seeing 'Albert Nobbs' but, having come across very mixed reviews, have never quite got around to it. From what you say here, we think that, finally, we shall abandon it altogether. Sometimes, as you write, something which is a labour of love does not necessarily convert into a commercial success. I like these actors but was not motivated enough to see this movie. It reminds me that my paternal grandmother and her sister, both daughters of Irish immigrants, dressed as men on a lark and went into downtown Jamaica, Queens one fine day. They were both arrested. This was the 1920s. It was illegal for women to dress as men! Times have changed as far as the law goes, but I'm not sure it's socially acceptable in every state and city. I think you've touched on a critical point, which is that for a movie to be successful, one almost always has to have some feelings (god or bad) for the characters. I didn't think much of George Clooney's "Generations" because I didn't care for any of the characters. Yes, exactly, Jane and Lance. A 'labor of love' should be looked at with suspicion, most especially because the creator is usually blind to its faults. Kathy: Well, we know that many women did successfully masquerade as men and fought in wars and did their best to get by. It's no secret. But it's not handled very successfully in this well meaning but essentially dull film. Naomi, yes, I agree. It's really a shame because the movie could have been something really special. Mark, I'm not a big fan of Clooney so I wouldn't have seen GENERATIONS anyway, but I definitely agree with your point. Somebody in the film has to be likable, and if not likable, at least intriguing and interesting. Vanity projects, IMO, never come to any good. 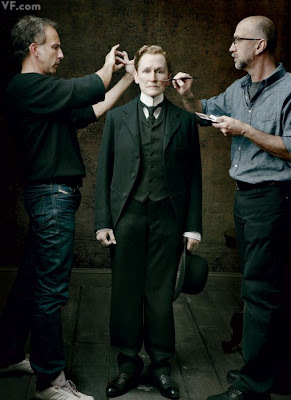 They are often far too personal and that deep attachment the actor/writer/director has for the work rarely ever translates to anything that can be universal. That she took so long to get this on film and released to the public only serves to underscore my theory. She did the play back in 1982! I bet this was so much better on stage. I saw a few clips and I thought it one big "zzzzz" and so I never bothered with it. You and I are in agreement again, John. But even so, I wanted to like it just because of its history and the fact that it was Glenn Close.